The Middle East League was established in 2010 and is played between the months of September to April. 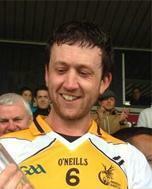 The League is run on a Tournament Basis with 4 rounds of League action across Senior, Intermediate and Junior Men's and Ladies Football as well as Hurling Super 11s, making its debut in the 2013 - 14 season. The League Champions are determined after the 4th round of action. The Season Ending showpiece, the Middle East Championships are played between the teams in the respective grades at the end of the League. Each teams League position determines which Tournament they compete in at the Middle East Championships. 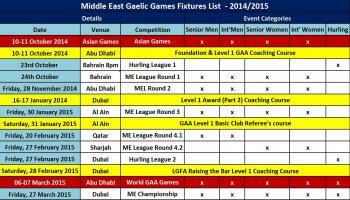 *Dubai Celts C and Sharjah Gaels deducted 10 points for non-attendance at the 2014 Middle East Championships. *Al Ain B, Dubai Celts C and Sharjah B deducted 10 points for non-attendance at the 2014 Middle East Championships.